I always look forward to quince season. There’s something about the process of watching this oddly shaped and textured fruit transform into the most delectable and uniquely flavored rosy compote that is so interesting and enjoyable. Whether it's poached fruit, jam or membrillo, quince arrives just at the time we need it as a lot of the stone fruit of summer quietly escapes our grasp for another year. I was just gifted with a bounty of fresh pineapple quince. An old friend introduced me to a new friend who has a tree in his back yard. It seems unusually early in the season but I’m more than thrilled. The aroma is transformative and lingers for days on end. Cheese flan is somewhere along the spectrum of custard and cheesecake. It’s found in Latin culture but is usually prepared using cream cheese and evaporated milk. For this preparation, I decided to use some goat cheese to add a layer of complexity that I thought would go well with the poached quince. For the liquid I use reduced ratios of wet ingredients and heavy cream and some Muscat wine. 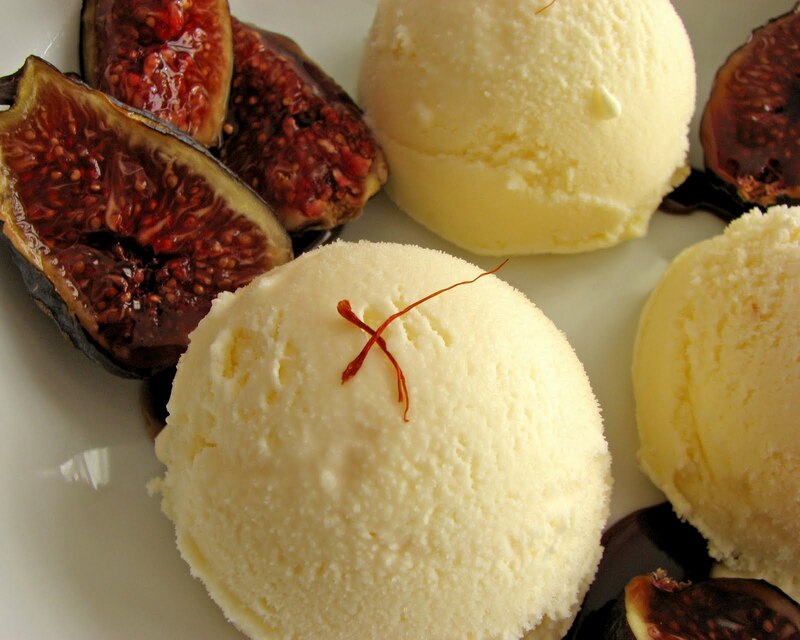 The result is a kind of dense but creamy custard that really delivers an incredible pop of flavor. The light caramel complements the quince and presents a nice counterpoint for the goat cheese. The quince takes some time to peel and poach, but the reward is tremendous. 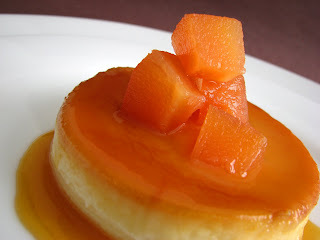 The flan is very easy and quick to prepare and bakes in 25 – 30 minutes. 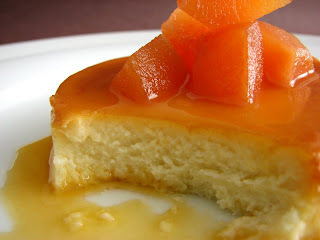 The flavors of both the flan and the fruit ripen overnight. If you do this in two steps, it will seem like no work at all. What you will have is a great celebration of this beautiful autumn. - As always, be very careful when working with caramel. Caramel burns really hurt, so always protect your hands and arms. As it reaches the right color, pour it into the ramekins and use a mitt or towel to carefully swirl just for a moment. The caramel does not have to go up the sides of the ramekin more than a little bit. - Raw quince are quite hard, so be careful when peeling and cutting into quince. Use a very sharp chef’s knife and a non-slip work surface and watch your fingers. I find it easier to core if they are first cut in quarters. - I keep the poaching liquid for the quince very simple so the true flavor comes forward without competing with the flan and the caramel. The syrup left over from the quince can be used to flavor drinks or drizzle over ice cream. 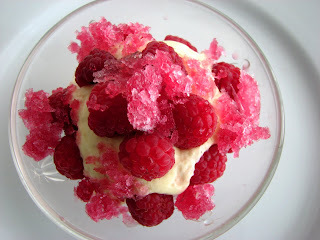 You can also use it as a base to make sorbet or ice cream. - If you can’t find an inexpensive Sauternes or Muscat, use a Monbazillac or Viognier or other favorite white wine that has a very slight sweet edge. - Don't be tempted to bake it much longer than the recommended time. They will firm up as they cool. 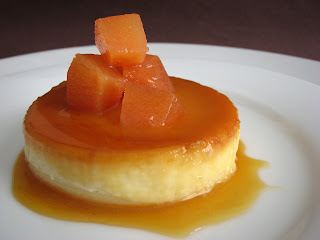 The baked flans rest overnight in the refrigerator to better create the liquid caramel sauce. The sugar has a chance to liquefy and they are easier to unmold. Once they are unmolded, let the flans sit for awhile until they can be served at room temperature. I’ve also eaten them a couple of days later straight out of the refrigerator. They are completely different – very dense with a mellow cheesy flavor. Also really delicious but in a different way! 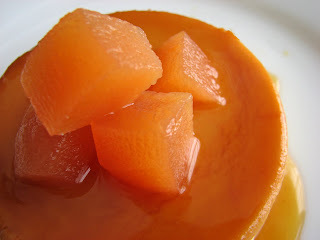 - I’ve also made this flan base and steeped it overnight with a pinch of rosemary. 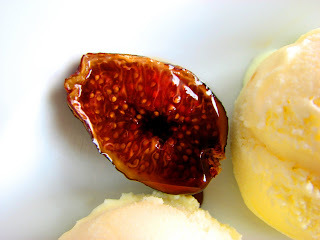 The next day, I strain it out, bake and serve with quince, fresh fig or pear compote. It would also be delicious with an apple sauté. Prepare caramel by placing sugar and water over medium high heat. If the sugar spatters up the sides of the pan, brush down the sides of the pot with a brush dipped in water. Cook the caramel until it is a medium amber. Take off the heat and wait a few seconds until it darkens a bit more on its own. Pour enough into the ramekins to coat the bottom and swirl just a bit up the sides. In a food processor, blend goat cheese, cream cheese, sugar, salt, cream, wine and for just a minute or so. Pulse just until thoroughly blended. Pour into prepared ramekins. Bake in water bath @ 325 degrees for 25 to 30 minutes. Cool and chill overnight. To unmold, set the ramekins in about an inch of water that has been simmered and taken off the heat. Leave them there for about a minute. Remove them and run a very thin knife blade or small offset spatula around the rim. Invert onto a serving plate and give it a good tap. It should slip right out along with the liquefied caramel sauce. Serve at room temperature with poached quince. Bring the water and sugar to a boil in a medium saucepan. Take off heat and add the lemon juice. As you peel and core each quince, cut them into quarters and place them in the lemon syrup to keep the oxidation at a minimum. Bring the quince and syrup to a boil. Reduce heat and simmer, stirring occasionally, until the quince are tender and have turned a deep pinkish orange. Cool and transfer to a clean airtight container and chill. Peaches are so superb right now it’s hard to resist buying them in great quantity. I found some amazing peaches at our local farmer’s market that were brightly blushing, fabulously fragrant and sensationally sweet. 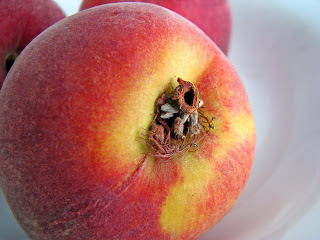 Nothing compares to a ripe and juicy peach full of the unmistakable flavor of summer. Let’s jump at the chance to enjoy the last of this season’s goodness before they make their exit for another year. I set out to make something very simple and light that would showcase their luscious fresh flavor. This is a soft and subtle celebration of peaches, perfectly cool and creamy after a delicious meal, a gentle and sweet reminder of the good grace of this magnificent fruit. 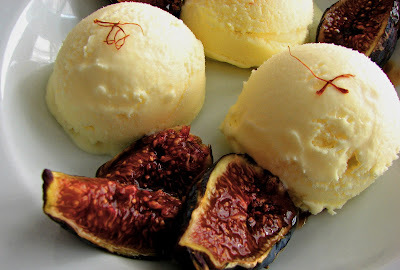 - The peaches for this dessert must be at peak ripeness or you won’t have the desired flavor. Find the best peaches you can get your hands on! Adjust the sugar in the recipe according to the sweetness of your peaches. 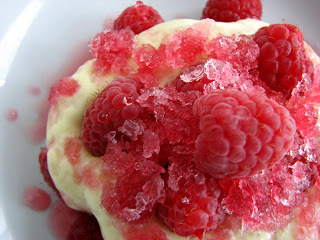 - I like this on its own, but you can serve it with berries, almond cookies or a very light sprinkle of almond praliné. Line an 8” x 4” loaf pan with plastic wrap, leaving an overhang on each 8” side. You can also place a strip of parchment paper on top of the plastic to help form smoother sides. Coarsely chop the peaches and place in a food processor with the lemon juice and 1/3 cup of the sugar. Process until you have a smooth puree. Press the puree through a sieve to remove bits of skin. Taste for a balance of sugar. Beat egg whites until they are opaque and hold soft peaks. Add remaining 2 tablespoons sugar just a little bit at a time, increasing speed to high. Beat until meringue holds stiff, glossy peaks. 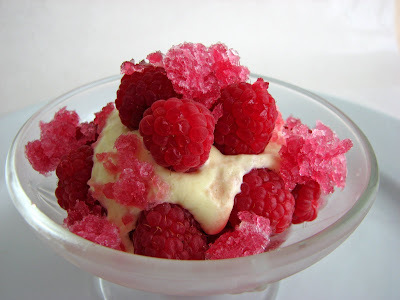 Whip chilled cream with kirsch or almond extract just until it holds soft peaks. 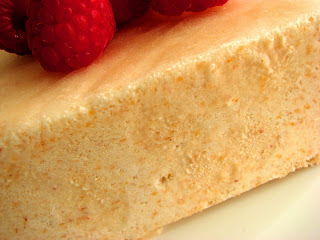 Gently fold meringue into whipped cream, then fold into the peach puree. Pour the mixture into the prepared loaf pan. Smooth the top until it’s level and fold the ends of the parchment paper and plastic wrap over to cover. Place in your freezer until firm, about 8 hours or overnight. 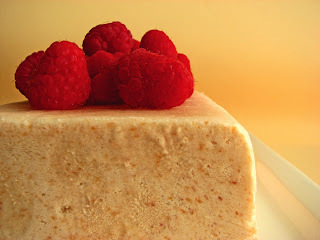 Run a thin knife or small metal spatula around the edges of the pan to loosen the semifreddo. Place a serving plate on top of the pan and invert. Carefully pull off the pan and its lining.